The United Daily News Group is currently Taiwan’s largest privately-operated Chinese-language media group; it evolved from a daily newspaper and gradually expanded into four newspaper brands as well as digital news platforms. Based on such solid foundations, the Group explored further possibilities in providing content and services beyond news with its expertise in journalism and knowledge of various industries. The United Daily News Group comprises five newspapers: the United Daily News, the Economic Daily News, the United Evening News in Taiwan, as well as the World Journal with editions published in North America and South-East Asia. The predecessor of the United Daily News (UDN) was the United Edition of three newspapers: The People’s News, All Citizen’s Daily, and the Economic Times, which merged in 1951. Circulation at the time was 12,000 copies, and by 1986 the number had topped 1.5 million, making UDN Taiwan’s largest newspaper that year, and until this day the UDN Group remains Taiwan’s largest privately-operated Chinese-language newspaper group. Founded in 1967, the Economic Daily News (EDN) is the most circulated professional economic and financial newspaper in Taiwan. Over the past 50 years, the EDN has continued to provide accurate and in-depth content at real-time, in multi-media forms and on all platforms including newspaper, website, mobile app, and social media. Widely recognized for its expertise in journalism, the EDN enjoys a large user base including entrepreneurs, executives, professionals, and investors, and has won numerous awards. The newspaper has now evolved into a financial media group that encompasses news, events including forums, exhibitions, and lectures, as well as the publication of books, periodicals, and yearbooks. The United Evening News (UEN) was first printed in 1988 and is now the only evening newspaper in Taiwan, providing the latest securities and investment news in print after the stock market closes. It pioneered the horizontal layout of news articles and printing the names of each journalist to hold them accountable for their articles. To serve the Chinese-speaking community globally, the Universal Daily News was launched in 1976 with its headquarters in New York and branch offices in San Francisco, Los Angeles, while the Southeast Asian edition headquartered in Bangkok serves readers. The World Journal is the largest Chinese-language newspaper in North America and one of the few daily newspapers that is distributed across the U.S. The crucial role it plays in immigrants’ adaptation to the local communities has been praised by the former U.S. President George W. Bush and Mr. Jean Chrétien, the former Prime Minister of Canada. For more than a decade, the UDN Group has dedicated itself to digital convergence, and aimed at providing services that users need, anytime, anywhere, and through appropriate formats. Therefore, in addition to the major news website udn.com, which is Responsive Web Designed (RWD) and thus mobile-friendly, various apps have been developed to cover news services and beyond, including finance, lifestyle, reading, shopping, travel, events, and ticketing, providing various services to address every aspect of life today. The udn.com news website is the UDN Group’s future media powerhouse; it is more than just an online edition of a newspaper, as it is also an Internet medium directed toward digital convergence. In addition to e-versions of daily news articles as printed on the Group’s newspapers, there is more and more digital content including videos and multi-media presentations. The udn.com site ranks the highest in website traffic under the category “news media” by broadband connection and the highest by mobile connection. As one of the largest content providers in the Chinese digital world, the UDN group provides more than 1,000 pieces of news and over 100 pieces of audiovisual news daily, all of which are archived into udn data, the largest news database in Taiwan and home to more than 12.8 million articles and 7.3 million file photos as of December 2018. The UDN Group launched its publication and reading services with an aspiration to expand the Group’s content beyond news. udn Reading provides a diverse e-reading service comprising tens of thousands of e-book titles, including those from the Group’s publishing houses and collaborators, along with a plentiful assortment of e-magazines and electronic newspapers. udnFunLife was founded in 2017 as a spin-off of the UDN Group’s event functions with its mission of “Bringing the World to Taiwan.” In recent years, it has hosted large-scale cultural events, such as performances by Cirque du Soleil and Cavalia; classic musicals including “Notre-Dame de Paris” and “Chicago”; exhibitions featuring the paintings of Jean-François Millet, Vincent van Gogh, and Pablo Picasso; and the Studio Ghibli collections, including an animated version of the 12th-century masterpiece Qingming Festival Riverside Scene painting in collaboration with the Shanghai World Expo. The uDesign website is a cultural and creative e-commerce platform that brings together brand-name Taiwanese and international designers. It works with the Red Dot Design Award to provide latest updates in the design arena, making the concepts and designs of the creators better known to the public to foster support and boost their international visibility. udn Tickets is a website vending tickets for exhibitions and performances that integrates big data, multi-media, and targeted marketing strategies to provide comprehensive ticket sales and promotion via an online platform. 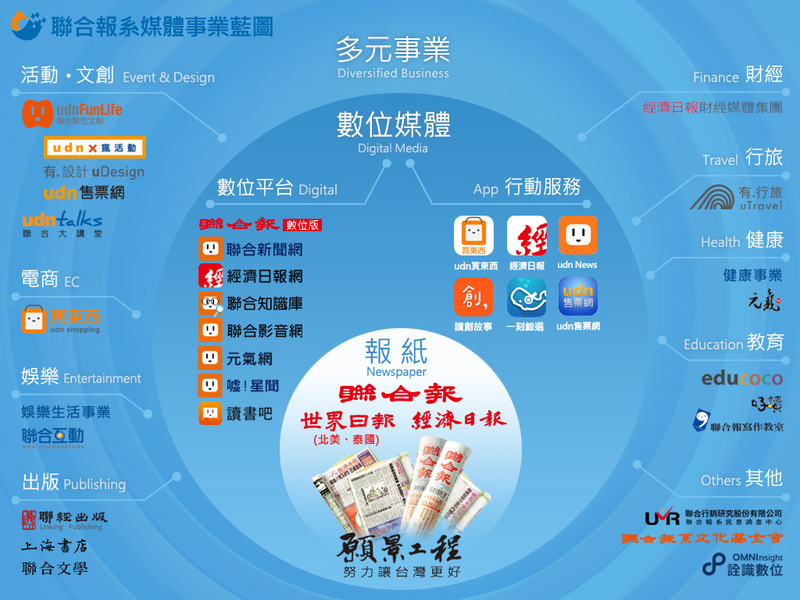 The udn Shopping website was launched in 2011 to tap into the e-commerce market, and has now evolved into one of Taiwan’s more prominent online purchase platforms. In addition to displaying and selling various commodities, UDN Shopping also works with charities to raise funds and promotes quality produce from local farmers. Linking Publishing Co. is dedicated to publishing outstanding books and magazines, with signature writers including the Nobel Literature Laureate Gao Xingjian. The Shanghai Bookstore specializes in importing the most recent editions of books published in the Chinese mainland. Unitas is a literary publishing company that has won numerous Golden Tripod Awards, the highest honor in Taiwan’s publishing industry (with over 1,000 titles submitted for less than two-dozen awards each year), making it a prime mover in the development of Taiwan’s literature. Since 2003 the United Daily News has dedicated a page to educational materials for youth and launched an independent Student Weekly in 2009. UDN’s education division also organizes writing classrooms and the UDN Cup National Composition Competition attracts participation from tens of thousands of students annually. With the brand name Educoco, it provides high school teachers and students with a platform that enhances learning through online social interactions. The udn Productions platform produces high-quality dramas. The most recent production “High 5” broke the record as the most viewed Taiwanese drama series on the online video streaming platform iQiYi and recorded 400 million hits on Youku. The first ever documentary produced in 4K resolution in Taiwan “Documenting Victory in Etching” was produced to mark the 90th anniversary of the National Palace Museum in Taipei and received the bronze medal under the Arts/Cultural category at the 49th WorldFest-Houston International Film Festival. The udn Celebrity-Guided Fun Travel website was launched in 2012, which features trips designed and guided by experts in various fields such as food, wine, photography, classic music and ecology, who bring a fresh and unique touch to each of the trips. In 2015, the project evolved into a travel division within the UDN Group, uTravel, which continues to promote in-depth lifestyle experiences and aesthetic forms of travel. uTravel also plans overseas summer camps and winter camps for students, under the brand name udn Camp, with features ranging from NBA, NASA space science, and forensics with Dr. Henry Chang-Yu Lee. As Taiwan is transitioning into an aging society, the UDN Group has dedicated content and events to help readers live better, healthier lives. In addition to a full page on health issues in the daily newspaper (with more digital content at health.udn.com) and the Genki Weekly has won several awards from the Society for News Design. The health division also works with government offices and health centers on organizing health-related forums and publishes books to raise awareness in many areas of health. The division also provides multi-platform marketing services to suppliers in the medical and health industries. In addition to the brands specified above, the UDN Group also includes cultural and charity foundations, and entities specializing in marketing research, digital services, printing, and transportation. OMNIsight, is a spin-off company that centers on data analytics, providing scientific solutions via a social networking strategy aimed at expanding its services into the area of digital marketing.